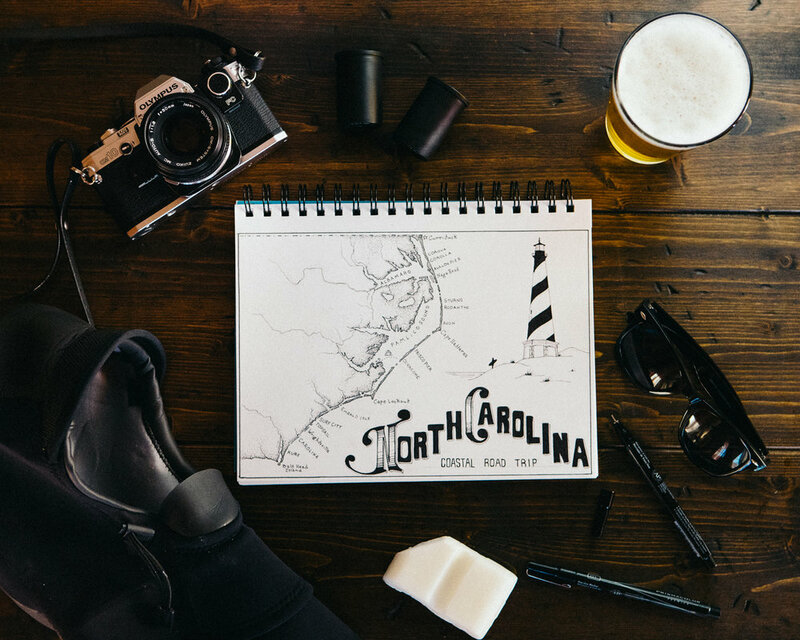 It's January 2017 and I just finished a pencil sketch of the North Carolina coast, putting a star next to all of the best surf spots. My long time friend and adventure buddy, Jackson Fox, plops down onto the couch next to me and catches a glimpse of the drawing. "LET'S DO IT! Hey, maybe we can even get some sponsors!" From that first trip we have collectively grown The Beans and Rice into a full service production company. Providing outdoor adventure brands with the highest quality, campaign-tailored, image packages. The Beans and Rice was created to solve a problem faced by marketing and creative directors in the outdoor industry. Brands in this industry require a ton of quality photos of their products in action. Ambassador programs can be touchy, leaving the director tasked with the hassle of hunting down the promised images from a 'free spirited' adventurer. When brands sign up to receive an image package from The Beans and Rice they are given a hard date of delivery and know exactly what type of content to expect. Our scope of adventure is quickly growing as we build a team of passionate in-house photographers and artist from all over the country. We are a content company, but more importantly, we’re doers--we’re funhogs, we’re creators. We’re real people. We’re not afraid to be in over our heads. We seek it out. Hell, it’s what we believe in. Driven by sustainability, we want to use our talents behind the lens to fuel bigger and badder adventures because we value the experience and a good laugh above all else. When you work with us, you come along. You come along for the real, the unscripted adventure. You come along with genuine people, and we believe that’s the only way to go. Starting an online presence from scratch is never an easy task. This process is made more difficult when faced with an extremely limited budget. We knew that if we wanted rally some awareness around our new brand, we would have to get creative. Thus, the 'Hunt For Waves' campaign was born. Not without frustration, my business partner, Jackson, writhed his way into a wetsuit daily, grabbed his surfboard, and we'd take to the streets of downtown Asheville, NC. Since the closest ocean was more than five hours from town, we drew a lot of attention to ourselves. Using this to our advantage, as people approached us to inquire about what we were up to, we passed out hand-drawn business cards with our logo and Intsagram profile name. The campaign was an immediate success, 'organically' generating more than 400 followers within two days and even the attention of many local brands. I believe that great marketers have to truly listen to their audience. After our initial success around downtown Asheville, our audience wanted to see more of this campaign. We decided to push the idea further by doing a 'Hunt For Waves' image for each brand we were collaborating with at the time. Again, we experienced a dramatic response in the form of another 200 followers within three days. We launched our website in October 2017. To allow for maximum customization, we used the Wordpress platform. The aesthetic epitomizes a simple but punchy vibe with satirical undertones. Rolling with the color palette of our original logo, we felt it best to stick with black and white, allowing the photography to carry the emphasis. Additionally, our woo commerce store will be launching by Spring 2018.